Today something completely different from the usual gameplay of The legend of Zelda – Breath of the Wild. 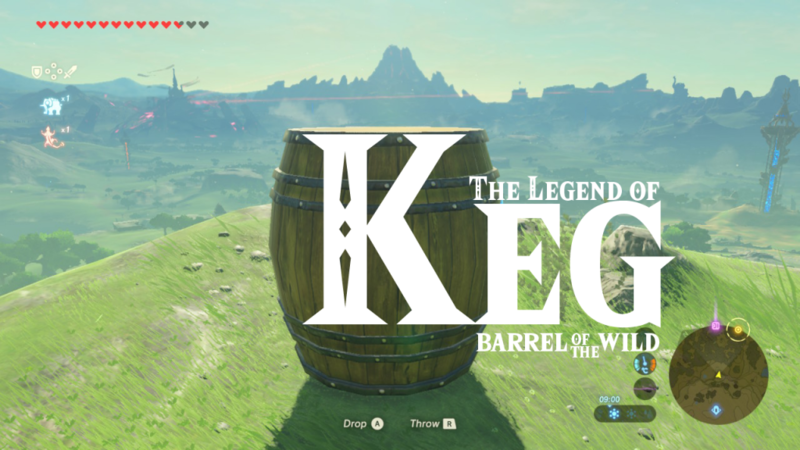 We present you The legend of Keg. 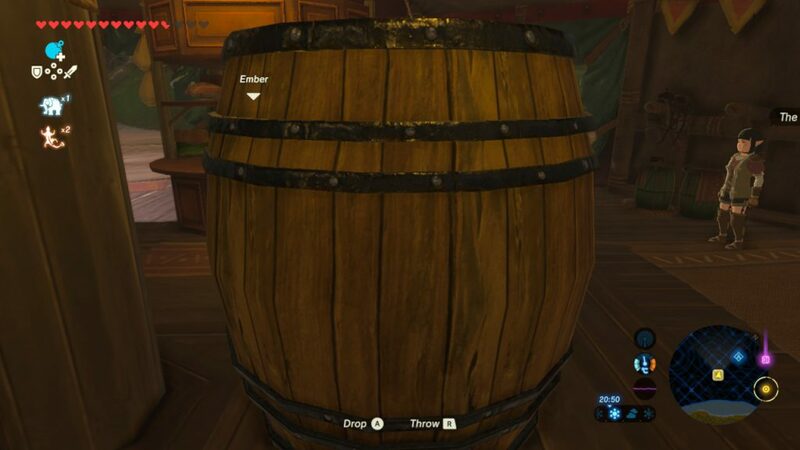 Or in other words: Barrels are actually quite useful in the game. 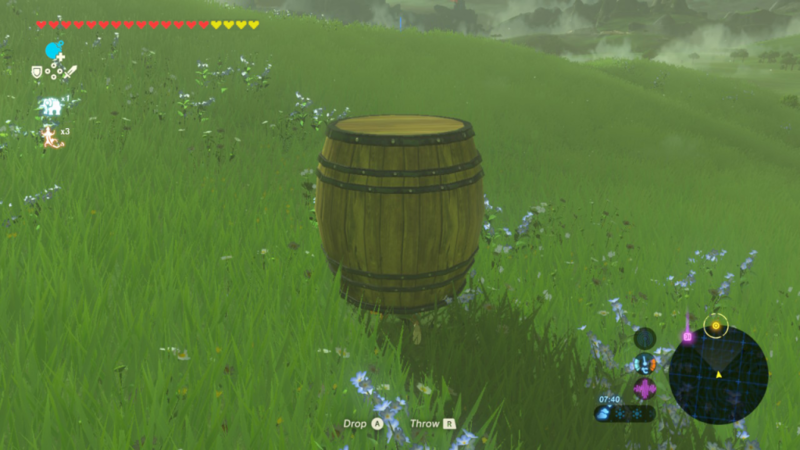 Today I found a barrel in the fields South of Hyrule Castle. 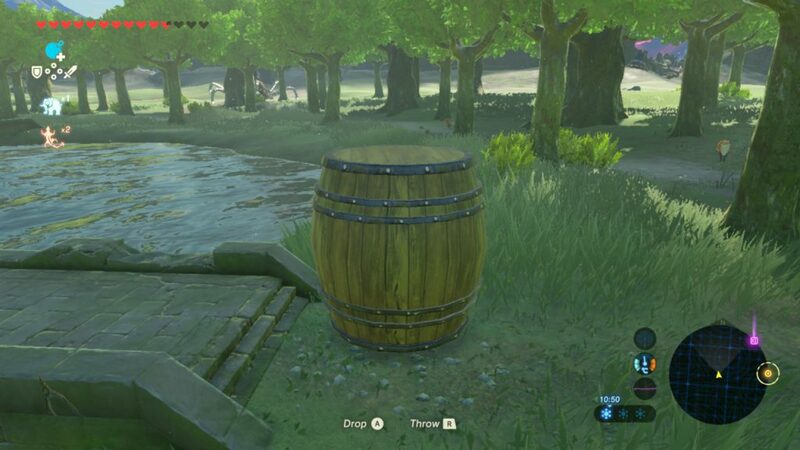 I wanted to hunt down one of the memories, but I am rather useless in stealth, until I came across this barrel. Of course, my husband was laughing at me telling me my idea would never work. The guardians would literally destroy me, he said. Little did we know that my crazy idea actually paid off. While I used this little trick, the Keg told me one crazy story. This is how the new legend is born. 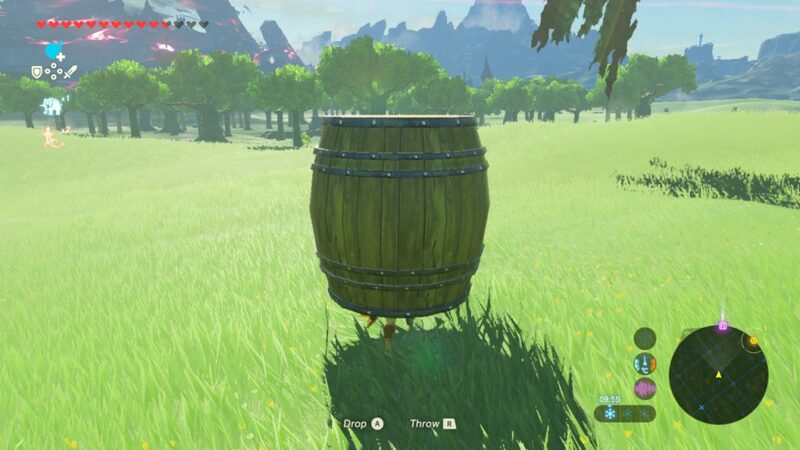 I present you: The Legend of Keg – Barrel of the Wild. 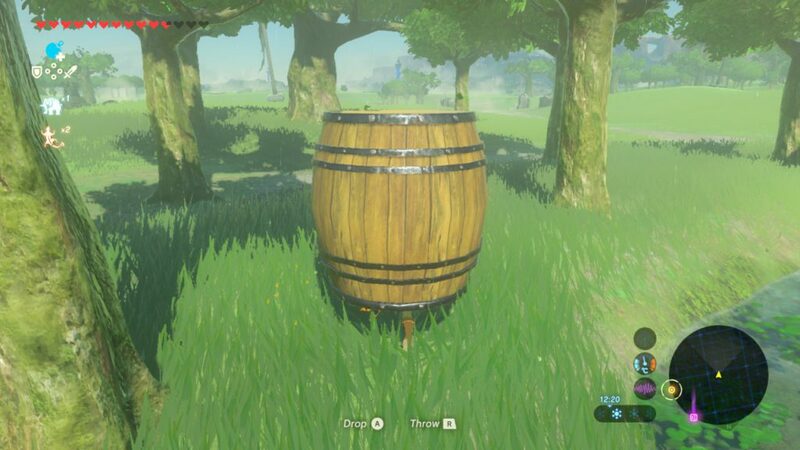 Deep in the wine cellar of Hyrule Castle, The Legendary Keg finally awakens from his deep slumber. He was captured by Ganon’s evil men and got ‘kegged out’ on the cold floor of the wine cellar. Finally woken up, he has one mission: safely escape the castle and get back to Kakariko Village, back to his children and his lovely wife. But there was one main danger, the Guardians with their fiery weapon that can annihilate you in mere seconds. Our brave hero ‘Keg von Kakariko’ is on his way. It’s a woody mission! He managed to escape Ganon Calamities’ grip and is now traveling through the lands outside the Castle, sneaking past the Guardians. Will he survive or will he end up as fire wood? To properly sneak past, he seeks cover in the nearby Forest. 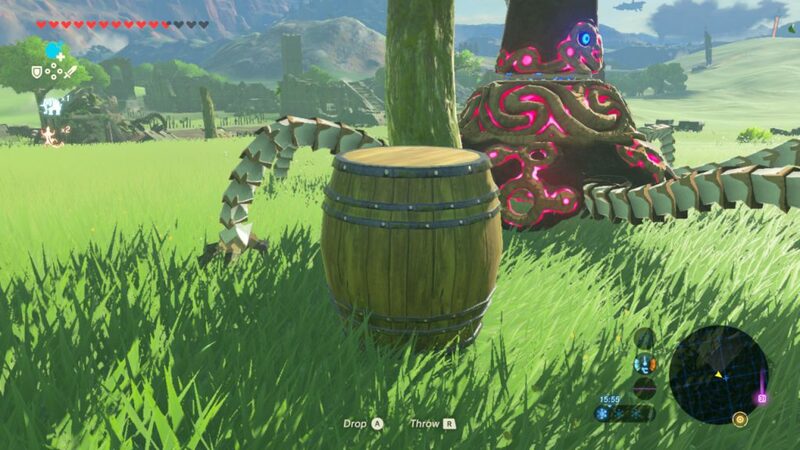 As you can see in this picture, a Guardian is rather curious about his round, cylinder shaped wooden existence. In shock, Keg von Kakariko quickly stops moving, hoping the overgrown spider like ‘Dalek’ would leave him alone. Unfortunately, the Guardian had to run towards him. He heard the battle music already and feared the worst. “I am going to end up as burned firewood!”. To his surprise, the jackass ran literally up to him, looking at him like he was a boring pile of fire wood. 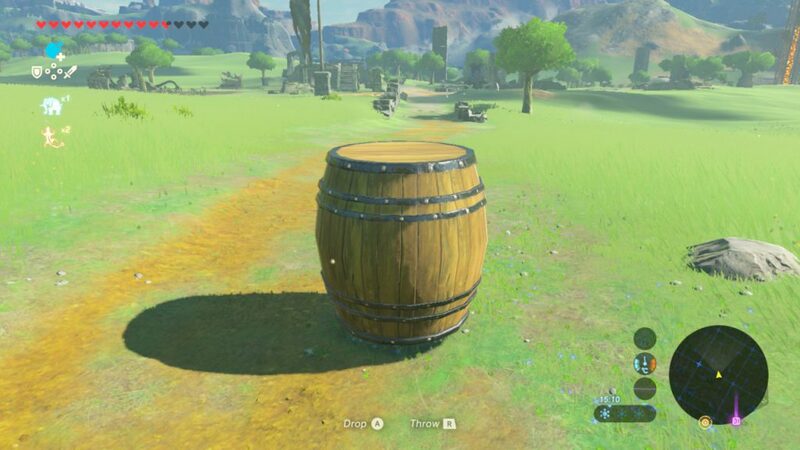 After a good 10 seconds, the Guardian finally turned away, minding its own boring existence of guarding Hyrule Castle, while ‘Keg von Kakariko’ was left alone alive. He sighed out of relieve “That was close to my woodhood”, and so he traveled onwards, saying “My legacy awaits!”. Leaving the fountain behind, he walks through the open fields and sees two more Guardians looking in his direction. His woody heart bonk is rising to a serious drum, knocking against his wood. To his horror yet again the music starts to play and the red lazer is aiming right at him. “My fault..!”, he yammered, “I didn’t stand still…”. He quickly hid behind a tree. He knew that would do little, but he tried it anyway. Mr ‘wannabe Dalek’ is locked and loaded and ready to claim his next victim to become a pile of burned firewood. Keg von Kakariko – He Stepped on me! He stood still as a wooden block and cried silently. Flashes of memories came through his mind: of his children, the mini beer kegs and of his lovely wife the wine bottle. He said his prayers to the Mighty Beer Keg God, awaiting that final blaze of fire, the wood blowing doom. But… to his surprise, nothing happened. Well, nothing… The guardian STEPPED ON HIM! Yes you heard that correctly! He stepped on him in a rather rude fashion. The Guardian was stepping on him, as if he was a dog turd lying in The Fields of Hyrule. After a tap dance of this mean Guardian and a final glare at possible eyes, he was free to go. Shocked of what just happened and feeling abused by a stinking Guardian foot, he gathered his courage and moved on. His first destination, the stables just outside the danger zone! Finally, he could sink his wooden bottom onto the beautiful hard floor of the Inn and take his well deserved nap. That day he did something incredible. He escaped Hyrule Castle, Ganon Calamities’ Grip and he survived the horrible Guardians, also known as overgrown spider ‘Daleks’. From that time on, they called him ‘Keg – The Hard Wooded’! Of course, next day things were much easier. With refreshed energy and cover protection and without much more delay he could finally reunite with his lovely wife and kids and live a happy life. My point of this story was simple. 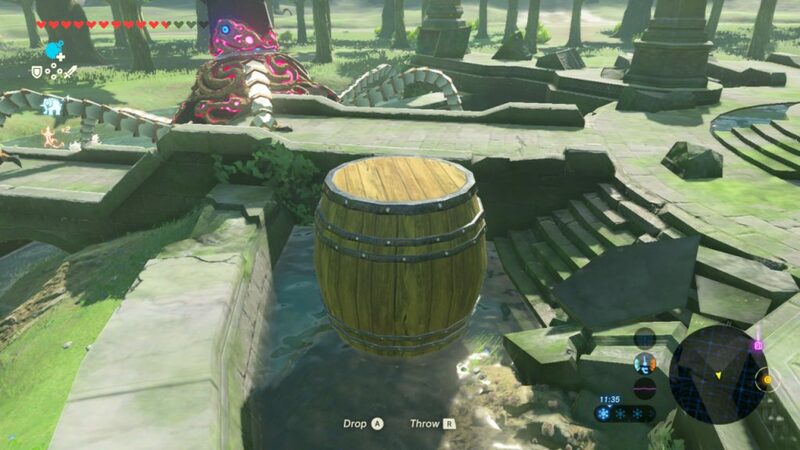 When Link hides in a barrel, even the Guardians will leave you alone. Another reason why this game is really frigging awesome! Previous Previous post: Zelda Breath of the Wild – Your Own House?? Omg breath of the wild sounds really awesome, I really wanted to play this game! After I started working, I became extremely busy that I barely have enough time to play games. Thanks for your comment! Yes, Breath of the Wild is a really awesome game. Soon I will write a review about the game. There is so much to do and to explore in this game. One cannot always work, so sometimes there is some time to play a game. The Legend of Zelda Breath of the Wild is my favourite game to play, but I play a lot of other games too. Zelda will never come out to PC. There has been a rumour about it after PC Gamer placed an article about the amazing game engines’ capabilities and that it had similarities with other great PC games and called it “The Most PC Nintendo game ever”. 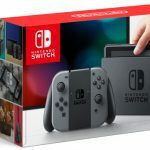 No, if you want to play The Legends of Zelda – Breath of the Wild, you are forced to pick up a WiiU or the all new console Nintendo Switch. There are perhaps illegal methods to play the game on PC, which I will not dwell into. Haha, that is so freaking awesome! It’s like when you would hide under a cardboard box in Metal Gear Solid, but even better! I’ve always been a huge Zelda fan and this new one on the Switch looks breathtakingly amazing! What do you think? Is this the best Zelda game yet? The game mechanics are really nice in this one. In The Legend of Zelda there has always been a lot to do and the games often felt more advanced compared to many other games out there. Gameplay wise the game is incredibly innovative and gives you a lot of freedom. You have a wide world to explore and find stuff into. The game plays like a sandbox in which you can do all sorts of things and using your special skills you can find things that are difficult to reach otherwise. Make use of the elements and your special tools you get in the first few hours of gameplay. This game is out for both WiiU and Switch. Side quests and with that the many different side stories are also a lot of fun and really make you immerse with the world around you. The main story on the other hand, could actually be better. It was lacking a bit of detail in my opinion, comparing it to the way I was used to with previous games in The Legend of Zelda series. But it is definitely a game worth picking up! I will soon publish my review of the game. That is so funny. 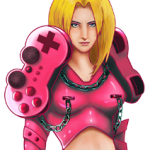 Personally I am a big fan of Zelda games. I still remember the old Zelda games, you know link to the past, Oracle of ages , Oracle of seasons , links awakening, Ocarina of time , Majora’s mask . Zelda breath of the wild I haven’t tried yet . Hiding in a keg to avoid enemy sounds pretty cool . Like most Zelda games there are some stealth Side quest. I should get this game a try soon . Nice story it’s funny . I’ve played most older Zelda games too. They all have been an amazing experience to me, I simply grew up with them. The latest Zelda game is a big open world to explore at your leasure. When you are strong enough you can go and defeat the big baddy. I’ve played it through by now once, but am still trying to get 100% on all the side stuff you can do. I love it!